It’s not a huge amount. But in 1982, the federal government was worried that big mining companies would take advantage of landowners. So it passed a law: if a company bought, leased, or rented mineral rights, it must guarantee to pay the landowner a royalty worth at least 12.5 percent of the value of anything extracted. 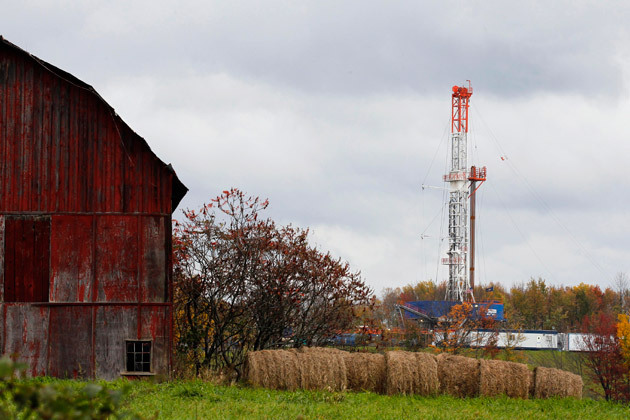 With the enormous expansion in natural gas exploration and fracking in Pennsylvania over the past few years, this law has provided a lot of assurance to landowners. Nobody knows how many thousands of leases that Pennsylvania farmers, businessmen, and other property owners signed to give Big Energy companies the right to drill on their land. But demand for natural gas was rising, everyone involved seemed happy with what appeared to be a decent deal. Was this a failure of the market? No! Landowners charge that the energy companies are depriving them of their fair share of the profits from their gas. They claim this isn’t a simple computer error or accounting glitch, but a systematic attempt to defraud them. The energy company deducts the costs it incurs in collecting, transporting, or marketing the gas. In 2010, the Pennsylvania Supreme Court ruled in the case of Kilmer v. Elexco Land Services Inc. that post-production costs could be legitimate deductions. However, in some cases deductions have been made despite wording in the lease specifically prohibiting it. The energy company offsets the royalties with “gathering charges” or other charges that are never explained. Current laws do not require the company to have its books audited by a neutral third party. The energy corporation sets up wholly owned subsidiary companies. It sells the natural gas to that subsidiary at an artificially low price, and the landowner’s royalties are based on that low price. The subsidiary later sells the gas for full value on the open market. The energy company retains the gas for its own use, or trades it in a barter deal with another company. Because the gas is never actually sold, its price is considered to be zero, and the landowner gets no royalties. What can be done to give landowners protection against mineral royalties fraud? In many cases, the most effective approach has been to address this matter through the courts. Chesapeake Energy has faced lawsuits in Texas, Oklahoma, Louisiana, and Arkansas over claims of underpaid royalties, and earlier this year a federal court certified an Ohio class action lawsuit against the company on the same issue. Here in Pennsylvania, Ostroff Injury Law is proud to be among the first law firms offering legal representation for property owners who are not receiving the payments promised in their energy leasing agreements. Our Pennsylvania fracking royalties fraud lawyers are dedicated to getting our clients the fair compensation they deserve when the drilling company or energy corporation has acted in bad faith. If you are a Pennsylvania landowner facing a sudden drop in your royalty checks for gas extraction, don’t allow the gas extraction company to breach your contract and take advantage of you. Call us today toll-free at (855) 880-6667 to have your questions answered and to schedule a confidential consultation with an attorney to review your case. We are one of the few Pennsylvania law firms with the background, experience, track record, and aggressive approach needed to help our clients recover unpaid gas rights royalties.